China kept their latest new satellite and rocket a mystery at today's launch. China launched an experimental satellite into orbit from the Jiuquan Satellite Launch Centre early on Friday using a new solid-fuelled carrier rocket. The Kaituozhe-2 rocket lifted off from Jiuquan in the Gobi Desert at 07:53 Friday Beijing time (23:53 UTC), carrying the Tiankun-1 satellite. Very little was revealed about the carrier rocket or the satellite in the build up to launch, with rumored names for both proving misleading. 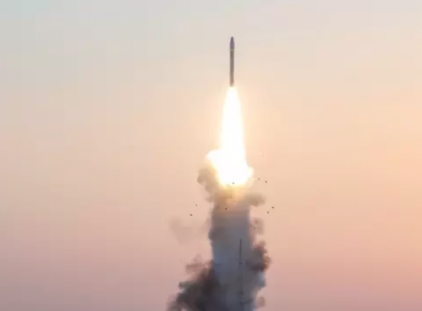 Kaituozhe-2, for which Friday was the debut launch, was developed by the country's missile maker, the China Aerospace Science and Industry Corporation (CASIC), which has a number of models of solid-fuelled launch vehicles. The vast majority of China's space missions are launched on liquid-fueled Long March rockets, developed by the China Aerospace Science and Technology Corporation (CASC), the main contractor for the space program. The new, small Kaituozhe-2 rocket, likely based on an intercontinental ballistic missile, is capable of launching 250 kg to a 700 km-altitude Sun-synchronous orbit, or 350 kg to lower orbits. It is also designed for fast response time.